Update: Twitter to charge for tweets next year? Subscription service only in Japan at first, but sure to spread. Or is it? 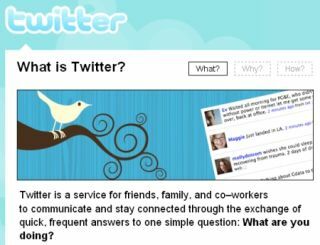 An announcement this week from one of the investors in Twitter has managed to surprise the usually unflappable Web 2.0 crowd by revealing that the company will begin charging for some services in January next year. Japanese firm DG Mobile, which is part-owned by Digital Garage, a Twitter investor, revealed that the microblogging site would charge users not to write tweets, as had been anticipated, but to read those of key users. At a press conference complete with slides and full explanations, DG Mobile's Kenichi Sugi said anyone taking out a paid-subscription option would be able to charge followers a small amount to read their tweets. The sum is likely to be in the ¥100 to ¥1,000 (70p to £7) range per subscription and will be set by the account holder. Twitter plans to skim 30 per cent of that off for itself. In terms of how it will actually work, that isn't clear yet, but it's likely that partial tweets will be available for free, with valuable content – images, video or original research – available only after paying up. The subscription service will launch in Japan in January 2010, with other countries sure to follow if it proves successful. Update: In spite of the DG Mobile briefing being public and well documented across the media, the company is now backtracking and saying there are no plans to charge Twitter users at all. Apparently, they say, it's all a 'misunderstanding'. Either that or a desperate attempt to backpedal after a lot of negative publicity.